Saturday the lady and I tried something new and spent the better part of the day in the Natural Bridge Wildlife Ranch near San Antonio. This 400-acre wildlife park is a drive-through adventure with hundreds of native and exotic animals. Hello from SeaWorld San Antonio! A killer whale (Orcinus orca) waves to a crowd Saturday during a performance at SeaWorld San Antonio. The sound of scurrying lizards is pretty unique. For a while on Saturday, it was all I heard. As I walked the trails in San Antonio’s McAllister Park, I heard the noise near every tree, but the creatures remained elusive. And then there was this guy. In San Antonio, one of the first natural places that I’ve begun to explore is McAllister Park. Featuring miles of trails through varied environments, both paved and otherwise, it gives a nice mixture of scenery. The trails accommodate hiking, jogging and biking. And if it’s your thing, it also features recreational areas for soccer and picnics. It’s been a while, hasn’t it? The last time I blogged was in August of 2010. Hopefully I can start making up for that. Several weeks ago I was visiting a friend in Rockingham County and was surprised to learn that she likes birds. A lot. Earlier this week I had a great outing in Huntley Meadows Park. Among the highlights were another green heron, adorable beavers and un-photographed raccoons/fox. 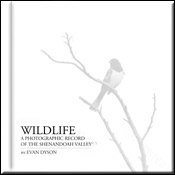 Photographer Evan Dyson established this site to highlight work being done toward the wildlife book, Wildlife: A Photographic Record of the Shenandoah Valley, as well as other wildlife projects. The previous title is now available for ordering, and features a variety of images taken in Virginia, in locations including Harrisonburg, Skyline Drive and Shenandoah National Park.